Let’s face it, anyone in the market for a European cab-over is these days spoilt for choice. Without putting too fine a point on it, it is a field full of fine contenders, each with its own way of wooing the attention of truck buyers who, in this country, are about as merciful as a malevolent magistrate. Once burnt, the scars don’t fade for a long, long time. So the thing is, if a certain make and model fails to fire in the estimations of owners and drivers, or suffers a run of mechanical maladies that corrode confidence and belittle the brand, then remoulding that truck’s reputation is about as easy as pulling teeth with tweezers. More to the point, truck buyers don’t have to look too far at all to find a highly competitive alternative ready, willing and able to become any buyer’s new best friend. These factors are, in large part, the problems facing Iveco and its Stralis cab-over. For one reason or another, powerbrokers behind the brand have, for many years, done little to incite long-term confidence, while mechanical issues have dogged any regard for reliability — particularly concerning the Cursor engine. However, things may be changing. At an Iveco product update in southern Queensland a few months back, it was an upbeat Iveco management team who insisted that times have definitely changed for the better, now that the brand operates within the vast CNH (Case New Holland) Industrial group. From the outside looking in, there certainly appeared a new vitality about the company, and a revitalised passion to make the most of every opportunity with what is an undeniably diverse and, for the most part, modern product range. Stralis, of course, is a critical flagship of the range, and typical of all continental contenders, there are many members of the family. As Iveco states with confident simplicity: "Stralis is one of the most comfortable and versatile trucks in the Iveco product line-up … available in 4x2, 6x2, 6x4 and 8x4 configurations in a variety of wheelbases across a selection of rigid and prime mover variants — there are 13 main models to choose from, widely used for single trailer and B-double work as well as in hook-lift, tanker and general haulage applications." and last but by no means least, generous warranty packages that, in the premier AS-L model, stretch to one million kilometres and five years. Iveco insiders are adamant that Stralis is these days a far better proposition than before. Obviously keen to promote the potential of the present rather than problems of the past, the company recently made available its latest AS-L Series II model for test runs. 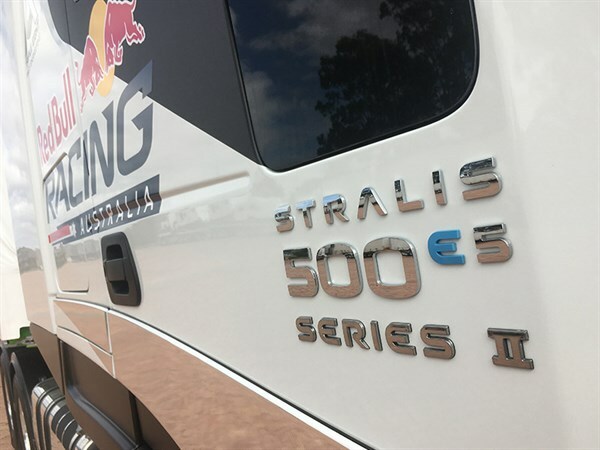 The test truck was, in fact, the Red Bull Racing prime mover, but with little more than 36,000km on the clock, and hauling a race car transporter to various venues around the country for the majority of that mileage, the truck certainly hadn’t worked particularly hard. Fortunately, commercial reality was the clear focus for this exercise, and the AS-L was coupled to Freighter’s latest EziLiner curtain-sider with enough load to deliver a gross weight around 40 tonnes. A worthy contender amid a full field of continental cab-overs. On paper, the AS-L stacks up well. For starters, the standard gross combination mass rating is 90 tonnes, while the cab, sitting above a set-back front axle, is a roomy, air-suspended and electronically tilted high roof model with good standing room and an optional aero kit. 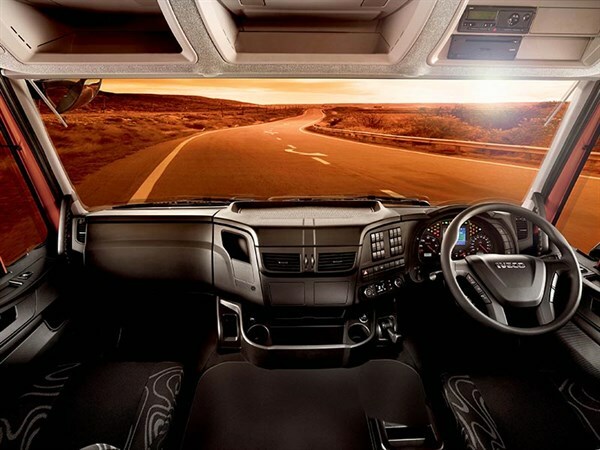 Underneath, and virtually guaranteeing comfortable ride quality, is a suspension layout comprising long parabolic leaves under the front, and Iveco’s own eight-bag air assembly at the back, complete with electronically-controlled height adjustment. Stopping power comes from Knorr disc brakes at all quarters, supported by the typical inclusion of ABS anti-lock and ASR anti-skid functions. Power goes to the ground through a Meritor single-reduction drive tandem fitted with diff locks and the choice of 3.4, 3.78 or 4.125:1 final drive ratios. Cursor 13. Iveco’s Cursor engine has certainly had a checkered career. Now in Series II version, performance is responsive and smooth. Iveco is confident that previous problems are now where they belong. In the past! A model offered primarily for line-haul work, the Stralis AS-L II has standard fuel capacity of 1,100 litres in two rectangular aluminium tanks, with an optional third tank adding another 200 litres. AdBlue capacity is 100 litres. Consuming that fuel, of course, is the 12.9-litre Cursor 13 engine, which in the AS-L Series II is available at ratings of 500hp and 560hp (373kW and 418kW respectively), with both ratings accompanied by peak torque of 2,300Nm (1,696ft-lb) on tap from 1,000 to 1,700rpm. 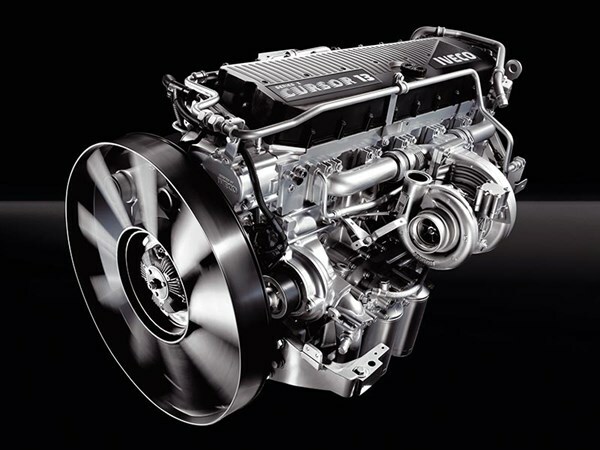 A Euro 5 SCR engine, the Cursor 13 has also evolved to Series II status, which at the very least suggests Iveco has identified and amended those issues that caused concern in earlier models. Again, the word from within Iveco is that Cursor’s Series II derivative is showing none of the problematic traits of its predecessor. Meantime, the relationship between Cursor and the 16-speed ZF Eurotronic automated transmission remains as smooth and intuitive as ever. It’s worth remembering that Cursor was developed from the outset to work in complete synergy with the ZF self-shifter. While there are today a number of outstanding engine and automated transmission combinations from various competitors, the Iveco and ZF combination was the first to get it right and, in the process, prove the effectiveness and potential of an electronic engine working harmoniously together with an automated transmission. Have no doubt, when it comes to slick shifts and intuitive operation, it’s a combination that still today rates high on the heap of engine and automated transmission packages. Forward vision is good, but mirror placement on the test truck impeded the view at the front quarters. It’s easy enough climbing into the AS-L cab, and inside it’s a tall and reasonably spacious interior fitted with upper and lower bunks. The lower bunk is at least big enough to offer a reasonable repose when compared with what else is available among European cab-overs, but as a twin-bunk design for two-up work, it’d certainly be a ‘friendly’ cab. Yet, when it comes to interior storage space, it’s a cab with more lockers, lids and bins, including a small fridge compartment, than any truck I can recall. Iveco designers, it seems, hate wasted space. Meanwhile, it’s easy to find a good driving position. But, like so many of its continental contemporaries, it takes considerable time to familiarise yourself with the plethora of functions and buttons that today are a fact of life for any driver. In the European context, digital readouts have largely sent traditional gauges to the scrap bin, but no two brands are the same. And in a fleet of mixed makes and models, it’s a factor that can be the cause of some confusion. That said, though, the logic is relatively straightforward, and important things like mirror adjustment and transmission modes are mastered soon enough. While on mirrors: they’re well-sized, but in the demo unit were positioned where they regularly impeded forward vision at the front quarters. Still, there’s a lot to like when you sit back and consider the Stralis cab on its own merits. It is, however, a little like Elvis — it loves to rock and roll. Sure, it’s not as bad as some I’ve driven over the years (notably earlier Volvo models), and there’s no question that ride quality and overall cab comfort are of a high order, but there’s equally little doubt that some stiffening of the cab suspension would be beneficial to road handling and the general sense of stability. In short, it would only enhance the appeal of an already comfortable, quiet and, for the most part, practical cab. Digital era: European makers have made gauges a thing of the past, obviously preferring digital readouts. 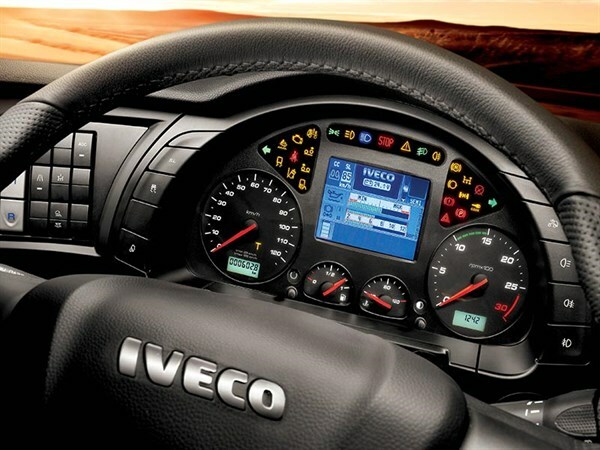 Iveco is no exception and familiarisation and use of the different systems takes time. The Red Bull Racing unit is powered by the 500hp version of Cursor 13. 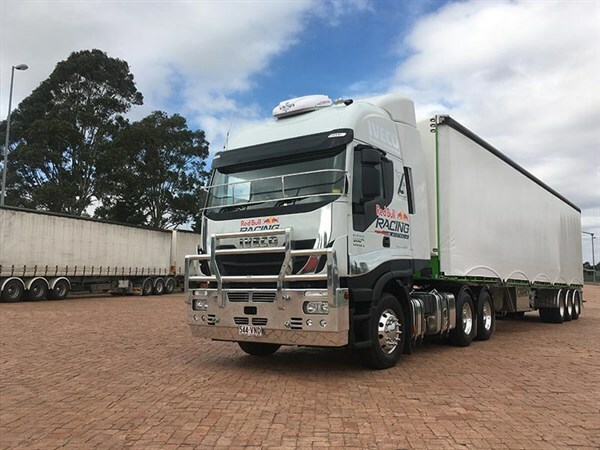 With the truck available for one day only, a run from Iveco’s dealership at Arndell Park in western Sydney down the Hume to Marulan and back – with a return detour through Picton for a drag over the sharp northbound side of Razorback — was perhaps an ideal route. After all, in this day and age, the 500hp version is arguably best suited to single trailer line-haul and regional applications, whereas the 560 rating — remembering that both ratings deliver the same peak torque of 1,696ft-lb — would be the more likely choice for heavier roles, not least B-doubles and top weight truck and dog duties. On this exercise, there was certainly nothing to complain about. The Cursor 13 is not a muscle man in the mould of a bigger displacement engine with deeper torque reserves, but nor is it a wimp. For starters, and much like all modern European models, good performance is invariably masked by the quietness of the cab, and nowhere was this more apparent than on the southbound run up Catherine Hill on the approach to Mittagong. 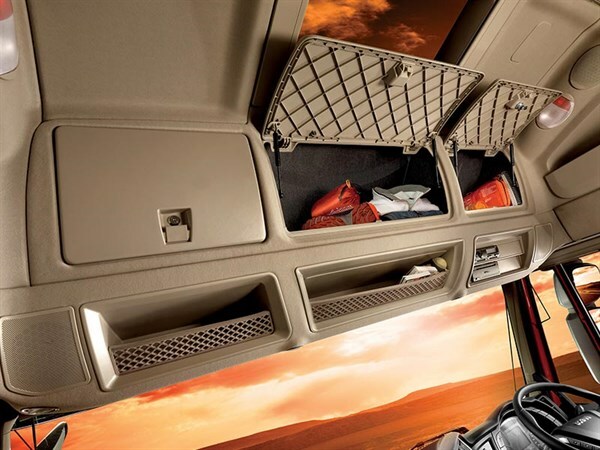 A cab of compartments: Stralis interior has an abundance of storage spaces, including a slide out fridge compartment. Overall it’s a neat layout but there’s an obvious abundance of plastic. With the transmission allowed to operate in auto mode for almost the entirety of the 325km round trip, Stralis dropped just three slots to 13th gear on the climb up the hill, with the rev counter dipping to 1,400rpm and the speedo to 60km/h. It was nothing less than a respectable performance, emphasised in large part by the responsive, intuitive relationship between engine and transmission. Notching 100km/h at around 1,450rpm, the run out to Marulan and back was an easy stroll, until the tough northbound drag up Razorback on the old Hume hauled the transmission back to 11th gear, with the engine reaching down to 1,300rpm and road speed to 40km/h. It wasn’t a breathtaking performance, but nor was it disappointing, and, best of all perhaps, there was no moment when a move to manual mode seemed a better option than simply letting the engine and transmission combination do their thing. On the run down the other side, engine retardation kept foot brake use to a bare minimum. As for fuel consumption, the truck’s on-board computer recorded a trip figure of 2.05km/litre, or 5.8mpg for older folk. While some might judge it an unimpressive return, I’d suggest it’s at least reasonable given the impact of a few suburban traffic snarls, the uphill run to Marulan, and a sharp climb over Razorback on the way back to the ’burbs. Series II showed enough on this brief exercise to suggest that it is at least a worthy contender in a field full of hugely competitive continental cab-overs. For Iveco, the job is to do the truck justice.